If you’re in Toronto between July 5th and July 21st be prepared for my favourite part of summer in Toronto: Summerlicious. Two times a year restaurants all over Toronto design their best Prix Fixe menus for lunch and/or dinner. There’s no brunch prix fixe (insert sad face). Even still, there are definitely more than a few restaurants we’ve been to for brunch that you should stop in and try for lunch or dinner. We have many favourites participating but here’s one I haven’t written about before. Coco*a planned a bachelorette for a friend of ours last summer and quickly realized how difficult it is to find a good brunch location in the central part of the downtown core. Cafe La Gaffe is a little gem on Baldwin St (a street literally lined with great restaurants) only a short walk from our hotel. We were seated on their colourful and covered back patio and started off our morning with a round of spicy caesars. Meals were ordered quickly and we loved what came out. 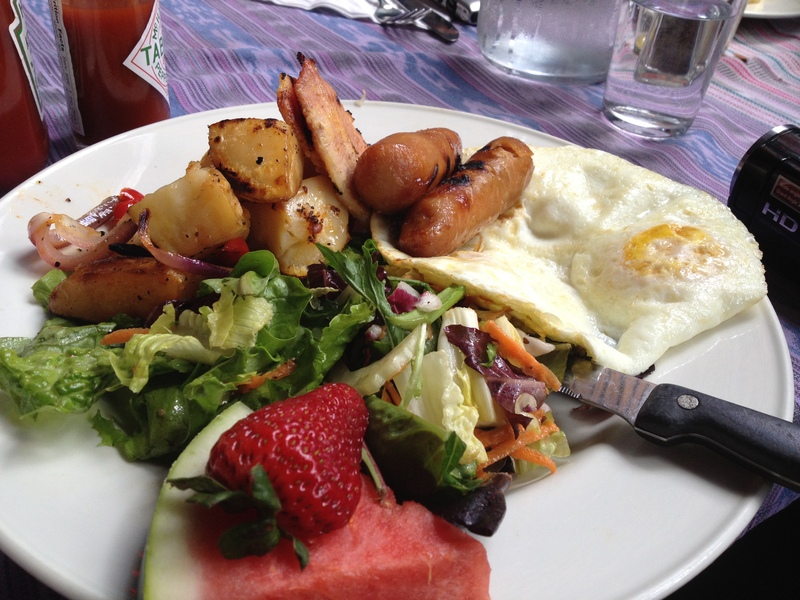 Here’s my breakfast at Cafe La Gaffe – Eggs (over easy), peameal, sausage, homefries and salad. 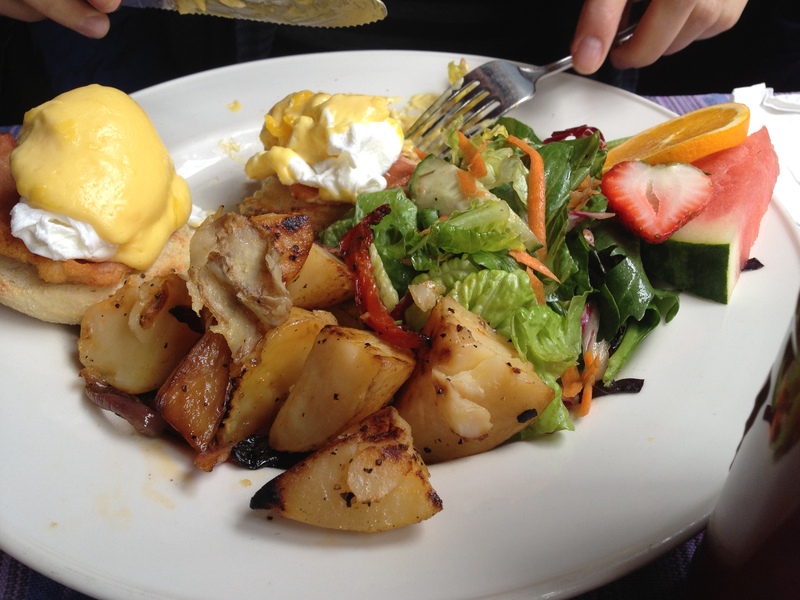 My brunch at Cafe La Gaffe. This was good. I imagine their lunch and dinner will be too! Really they had a little bit of everything they needed in my meal and they did my Eggs Over Easy perfectly. I am realizing now that it’s tough to find a kitchen that can do them without over frying the white into crisps or over cooking the yolk. 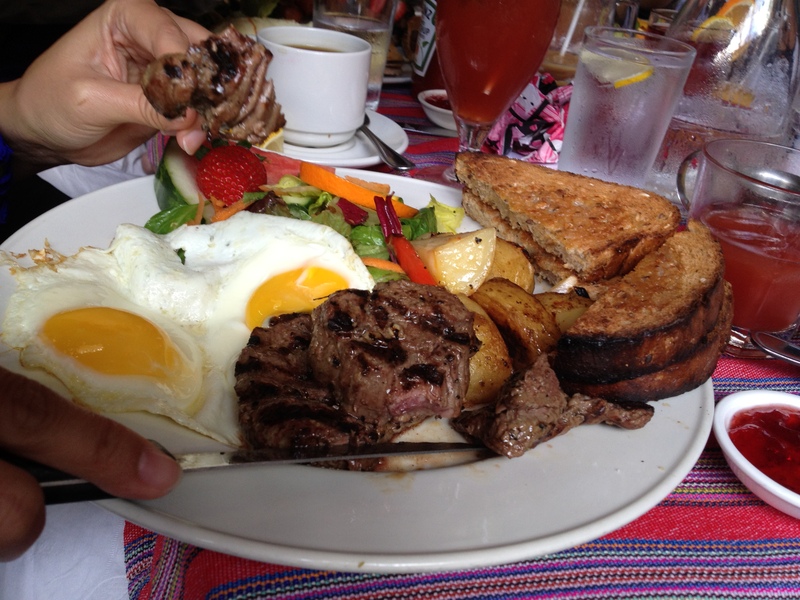 Here is Isabelle’s breakfast Steak and Eggs Sunny Side Up! Harlem West – Southern Fried Chicken and Waffles… need I say more? And there’s bound to be more – I have barely made a dent! The full list of restaurants and menus can be found on the Toronto Summerlicious Website! If you go to any of these let me know what you think! Maybe I’ll see you there? Previous PostCanada Day in the Capital and Kettleman’s Bagels Next PostBirthday Bonanza!